The film world is in a state of emotion following the loss of Nouzha Drissi: "We have just lost a grande dame". The International Film Festival of Marrakech learned some very sad news Sunday morning, the death of Nouzha Drissi in a traffic accident. Filmmaker and founder of the documentary Festival, IFAD Doc'Souss of Agadir, the world of Moroccan cinema pays tribute to her. "I knew her as part of IFAD Doc'Souss Festival of Agadir. She was an activist and a professional who has done a lot for cinema and especially for the documentary. She was also a very sensitive person, very open. We have lost a true friend, a great professional. What a pity. " "I knew her when I was production manager at 2M. Shortly after her return to Morocco she came to me to suggest some documentaries. I found her to be very dynamic, very involved. She really believed in what she was doing, and really wanted to give the documentary a place in Morocco. In addition, she had a very human side, very social. We have lost a filmmaking professional of great merit. " "I was very sad upon learning the news, especially since she had just move into the same neighborhood as me in Casablanca and in fact, we had become friends. Once, I remember, we were together on the train Tangier-Casablanca and we told each other about our lives. She had experienced trauma as a child because her parents had died also in a car accident in France. We have lost a grande dame. She was a rare, free, activist, and truth-loving." "Nouzha Drissi was someone I admired and liked very much. One of the few Moroccan women who never hesitated to say what she really thought, who defended us against the people who were supposedly for the cinema yet constantly criticised it. She was always there to support us, saying, "Pay attention! Only talent and the will to go forward can move us to make good films. For me it's a very great loss for the Moroccan film industry. " "I strongly applaud the documentary tradition that she had revived, which had disappeared from Morocco yet was widespread in the 50s and 60s. With IFAD Doc, she gave to Agadir the opportunity to host a high-quality, very useful festival." "I met her at FESPACO in Burkina Faso where she was promoting her festival. I remember her dynamism very well. She was a very active woman, committed and helpful. She was also on a committee of the CCM. She worked on many Moroccan films, at least fifty. Her advice was invaluable, she helped me prepare my new opus. She was a real activist. She was also very much appreciated in France where she was well accepted in the film and documentary network. It's really sad, she will be missed. " "I am very deeply affected by the news. I still cannot believe it. We worked together on a co-production and we were to have a meeting today to talk about the project. She was passionate, I a was jury member at her Festival two years ago. We had a great , close relationship. I will not be able to get over it. " "Nouzha was first a friend. She was a highly sensitive wwoman, a real artist. I am trembling all over, I cannot believe it. I worked with Farida and Nouzha on a docu-drama on the Sahara. We were to have seen each other today, but she is not here. It is more than a loss--it's immeasurable. She will truly be missed. She has managed to do what many others have never succeeded, to reintroduce this great art, the documentary, back into the Moroccan audiovisual landscape. " "She was a passionate, courageous activist. 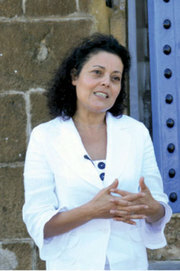 She was one of too few artists in Morocco who defended the documentary genre. She will remain engraved in our hearts and our memories, like her own work on remembering. I think the best tribute we can make to her is to continue to support her Festival." "She's a friend. A woman who was of great intelligence and probably of equally great suffering... I am very touched, I made a round trip to Casablanca for her funeral. She sent me a little message for the opening of the festival, saying she would send me "a thousand stars." I do not know what to say, it's always very difficult to talk about someone whose absence is eternal. She is a Grande Dame, and like all the greats, their time on earth will not last forever. "